For those who cannot attend or those who need convincing about attending the Slayer concert on the i$land on October 13, 2006 (it's also a Friday! ), here's an early soundboard show from the first European Slayer tour. As a fan commented on the internet: "A truly almost-sounding-like-an-official-live CD. Almost the entire 'Show No Mercy' and 'Hell Awaits' CDs are played. Bassist Tom (Araya) is great with his in-between-song comments." While they need no introduction, Slayer's Hell Awaits (1985) remains a touchstone for speed metal; and when producer Rick Rubin came on board to produce their next album, Reign In Blood (1986), Slayer defined the genre. The group was established by lead guitarist Kerry King in Huntington Park, CA in 1982. Prior to the beginning of Slayer, King was playing in another band with Tom Araya (vocals, bass) who King kept in mind on his list of players for the new band. During that time however, Araya had his hands full by working in a hospital as a respiratory therapist. However, the first member to join the band was Jeff Hanneman (lead guitars) who happened to be living close to King. King had heard Hanneman playing guitar and asked him to join his new band. Soon thereafter Dave Lombardo (drums) crossed the path with King and Hanneman while delivering pizza in the neighbourhood and was given the opportunity to play drums. To make the line-up complete, King called Araya to join the band as the lead singer and bass player which he then agreed. With the line up complete, the guys began thinking what to name the newly established band. According to fan website, slayersaves.com, after thinking up the name Dragonslayer, they finally agreed to name the band Slayer. Slayer started out by playing covers of Iron Maiden and Judas Priest in different high schools and local clubs but soon afterwards they started to write their own stuff. While one day playing in a local club, "Woodstock", they caught the attention of Brian Slagel, the owner of Metal Blade Records. After the show Slagel gave them the opportunity to be on the compilation album called Metal Massacre III. At the same time, they also asked a favor that Slagel would help them with their first record. And the rest, as they say, is history. 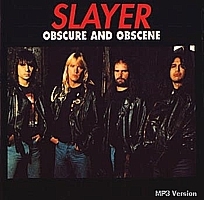 Other key Slayer albums include South Of Heaven (1988) and Seasons In The Abyss (1990). Click here for those who want to find out more about the band. Thanks to sjef1967 for contributing the tracks. Click on the link to order Slayer albums such as Christ Illusion, Hell Awaits, Show No Mercy and Reign In Blood.